from the The War of 1812.
on PBS (check local listings). Photo credit: Photo by David Litz. and Florentine Films/Hott Productions Inc.
who is featured in The War of 1812. 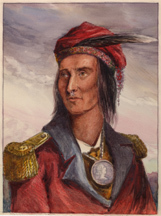 Great characters emerge in the film, including Tecumseh of the Shawnee nation, who attempted to form a confederation of Native nations, and died in battle; his adversary, William Henry Harrison, Governor of the Indiana Territory, whose debatable success at Tippecanoe, Indiana eventually helped him become President of the United States; James Madison, Father of the U.S. Constitution, a brilliant thinker and writer who was not a great President; and such storied Canadian figures as Canadian Governor-General George Prévost, who led the largest army ever to invade the Continental United States; Laura Secord, a Canadian woman who walked many miles to warn the British of an impending American attack; and Major General Isaac Brock, a brave and audacious British general who captured a large American army at Detroit without a fight. The film also recounts dramatic human stories of ordinary citizens, the political alliances of the various Native Americans nations, and the African-American slaves who reached for their freedom by fighting for the British. Donald R. Hickey, professor of history at Wayne State College, Wayne, Nebraska.~ He is the author of~Don't Give Up the Ship! : Myths of the War of 1812~and~The War of 1812: A Forgotten Conflict. Peter Twist, the Canadian director of Military Heritage, a historical military uniform and arms supply company.~ He has served as consultant on numerous film and theater projects, and is an expert on the military history of the War of 1812. Donald Fixico, a Shawnee Native American, is the Distinguished Foundation Professor of History at Arizona State University, and author of~Treaties with American Indians: An Encyclopedia of Rights, Conflicts and Sovereignty~and~Rethinking American Indian History. “The War of 1812” is a production of WNED-TV, Buffalo/Toronto and Florentine Films/Hott Productions Inc.,~in association with WETA Washington, D.C. The executive producers are John Grant and David Rotterman for WNED, and Dalton Delan and Karen Kenton for WETA. Produced by Lawrence Hott and Diane Garey of Florentine Films/Hott Productions Inc. Directed by Lawrence Hott. Written by Ken Chowder. Narrated by Joe Mantegna. Principal Cinematography by Stephen McCarthy. Production Design by Peter Twist. “The War of 1812” has been made possible by a major grant from The National Endowment for the Humanities: Because democracy demands wisdom*.~ With funding provided by The Wilson Foundation, Warren and Barbara Goldring, the Corporation for Public Broadcasting: a private corporation funded by the American people, The Arthur Vining Davis Foundations: Dedicated to strengthening America’s future through education, Phil Lind and The Annenberg Foundation.~ With additional support from The Baird Foundation, the Niagara Falls Bridge Commission and Jackman Foundation. *Any views, findings, conclusions or recommendations expressed in this program do not necessarily represent those of the National Endowment for the Humanities. Visit from the Late Penny Helzer?